Blogger Sans was designed by Sergiy Tkachenko as the FirstSiteGuide’s custom typeface, created primarily for the use in headlines of the website. Blogger Sans draws inspiration from the clarity and legibility of the popular font Dosis with an additional support of the lost Cyrillic languages. The bolder weights are lighter and softer. The following elements (-b-d-h-k-p-q-y-) are shorter, thus the headlines and subheads could be put in the dense line spacing. In addition the outline of the Blogger Sans is more smooth with better eligibility. Number of glyphs 547 and kerning pairs 2496 to expanded the number of supporting languages. 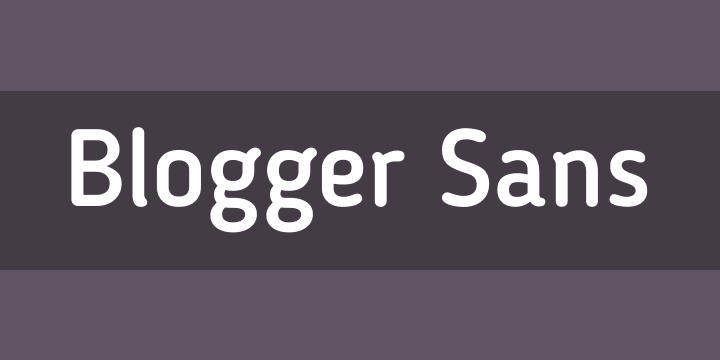 Blogger Sans comes in 4 incremental weights with total of 8 different outlines.Since Blogger Sans supports Cyrillic, it supports regional features for Bulgarian and Serbian (partially) languages. It also contains extra currency symbols, error signs, and dingbats.